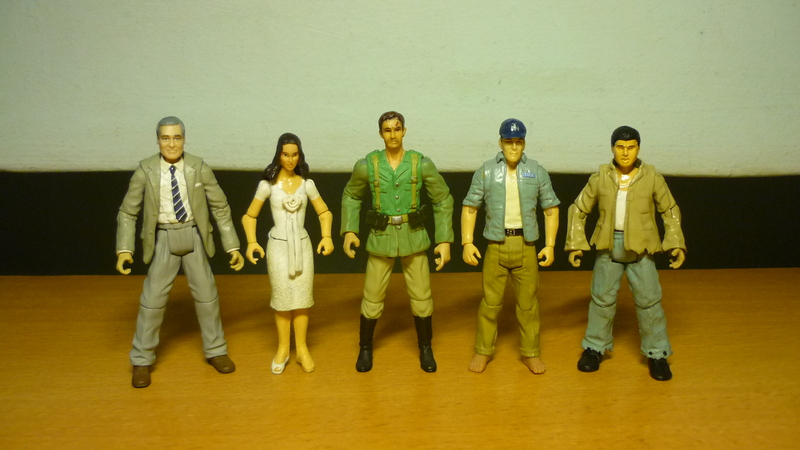 Here’s part 2 of revisiting my custom Indiana Jones figures. 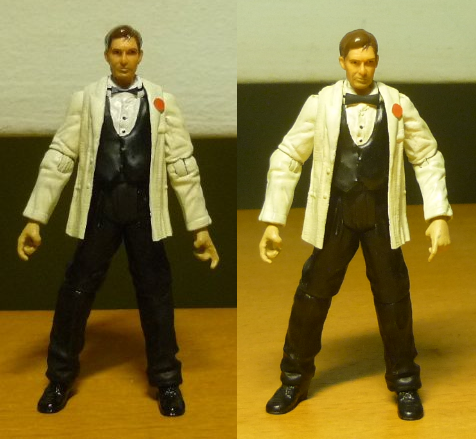 Shortly after I had created Tuxedo Indy, I developed a new method of creating a bowtie by sculpting epoxy onto a bowtie-shaped piece of paper, a method which was then applied on all subsequent bowtie figures. So I decided to revisit Tuxedo Indy to redo his bowtie. The previous bowtie did not look as prominent as the new one. Katanga was one of my early customs, and I wasn’t very happy with it. The head and neck were in one piece and it was just crudely pasted onto the torso, with the seams covered up by epoxy sculpted to shape like the turtleneck collar. Therefore the head doesn’t turn. Also, the badge on the hat was printed from a screen capture and it looked more like a smudge. 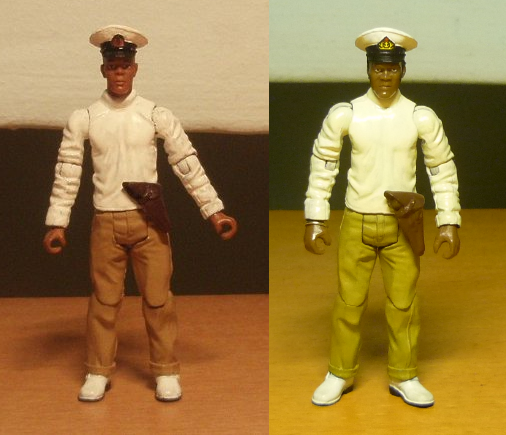 To address all these issues, I decided to create an all-new Katanga figure. The head of a more recent Mace Windu was used for Katanga. And this time round, the badge was designed on computer so that it now looks more detailed. In addition, a small metal ring was added to Katanga’s right wrist, to serve as a pair of bangles as seen onscreen. 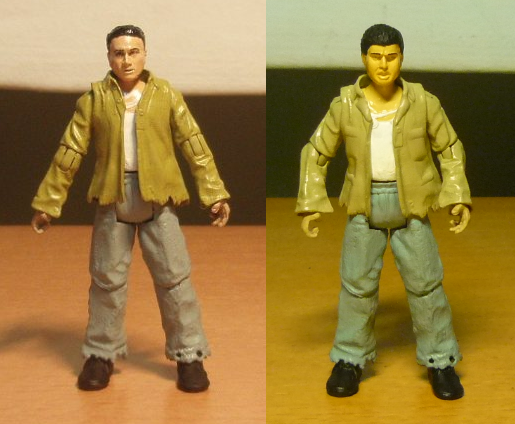 The pants were now painted in dark yellow, which I feel is more screen accurate. I had decided to sell off my G.I. Joe Hard Master & Snake Eyes twin-pack as I wasn’t really appreciating it much, and so I’ve replaced Alex’s head with that of Marvel Universe Professor X. 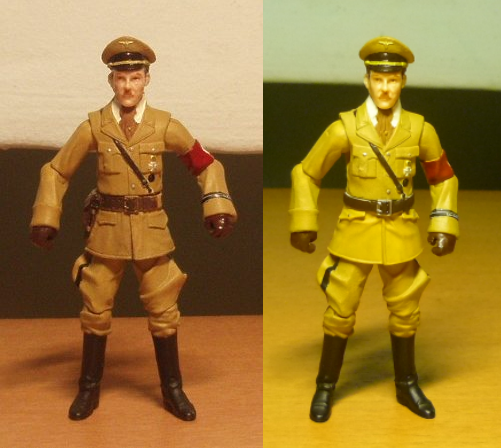 When I first created the figure, I was using Dovchenko’s skirt, which meant that the lower half of Hitler’s uniform actually belonged to a Soviet Army uniform. Not only it wasn’t historically accurate, but also that skirt didn’t really match up with the torso above as their sizes were slightly different. 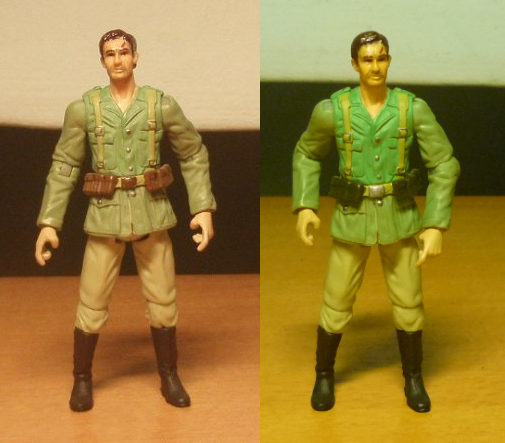 Therefore, I’ve decided to replace Hitler’s skirt with the original one that came with the Colonel Vogel figure, this time transferring Dovchenko’s belt buckle over to the figure. I had already taken out the gun holster and used it for one of my German officers. But this had led me to check and confirm a few details that I had suspected. In “Last Crusade”, you can’t really see whether if Hitler wore a gun holster. And after doing some image searches on the Internet, I concluded that Hitler never wore a gun holster with his uniform. Why would Hitler even need a gun? He probably always had his legions of SS bodyguards wherever he went. 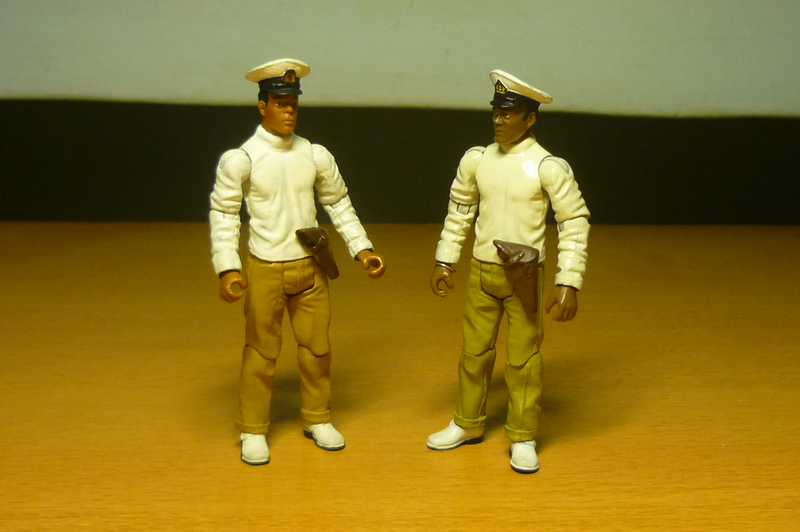 And I’ve also taken the opportunity to straighten Hitler’s military cap, it was off-angled. And what do I do with Dovchenko’s skirt? 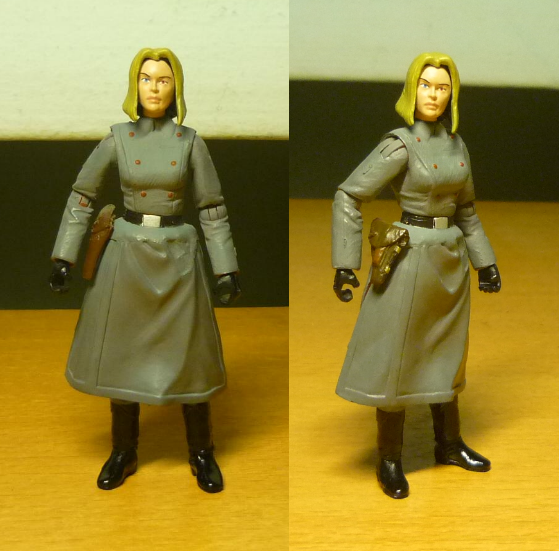 I’ve cut out the gun holster and gave it to Soviet Major Nadia Kirov. The Soviet-style gun holster is much more accurate than that cowboy Indy gun holster originally used. 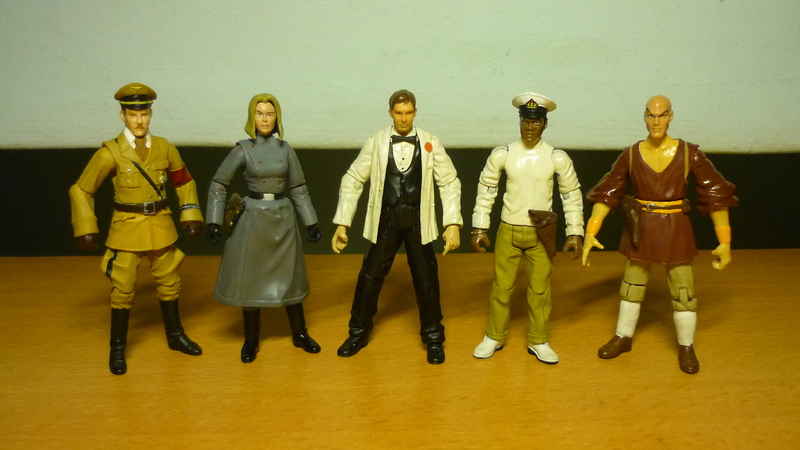 After creating quite a number of custom Indiana Jones figures, I have decided to revisit a couple of my earlier customs, some of which I felt were either done rather poorly, or were still lacking in certain details. After all, I had developed my custom skills over time and now I feel confident of applying the changes I had in mind. 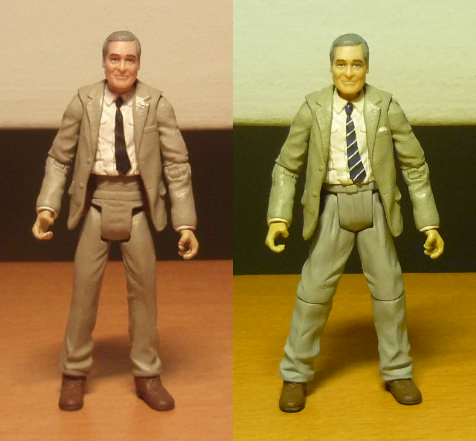 The original figure (left), and the revisited figure (right). I have repainted the belt pouches to dark green, and the belt buckle to metal colour, to better match the actual onscreen appearance. 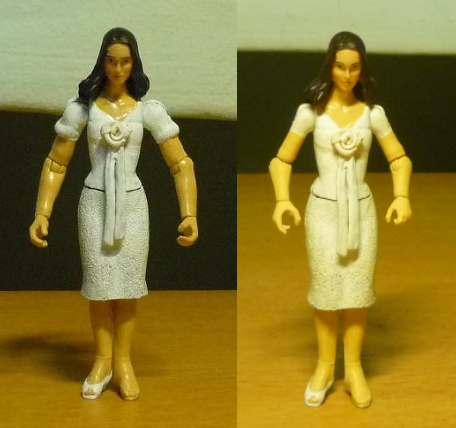 I have replaced Marion’s arms (which originally came from Mutt Williams), with that of Leesub Sirln, so now Marion looks considerably more feminine. 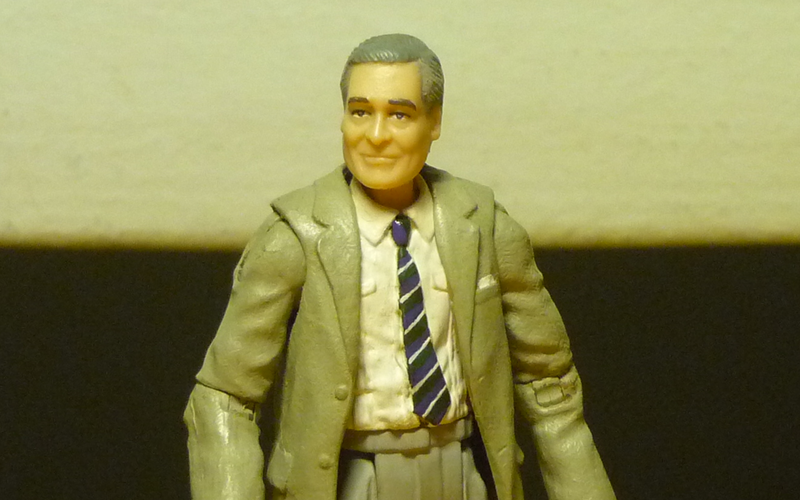 I’ve finally gotten around to paint the stripes on Brody’s tie, and also added a handkerchief in his chest pocket. 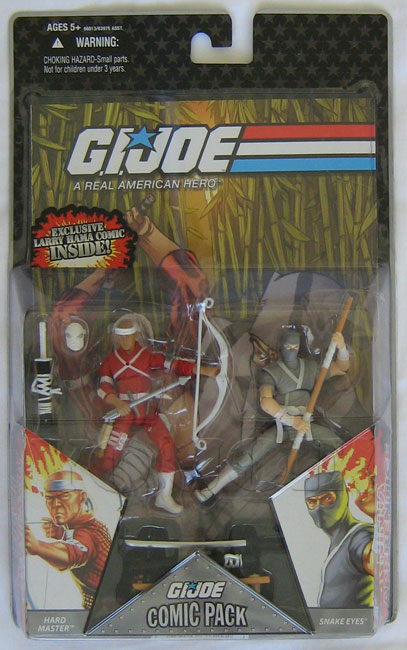 Previously, Brody’s head and neck were in one piece and were simply pasted onto the torso, with no articulation whatsoever. This seemed rather crude, so I decided to reattach the original neck and instead dremel hollow the head, such that Brody’s head can now swivel. 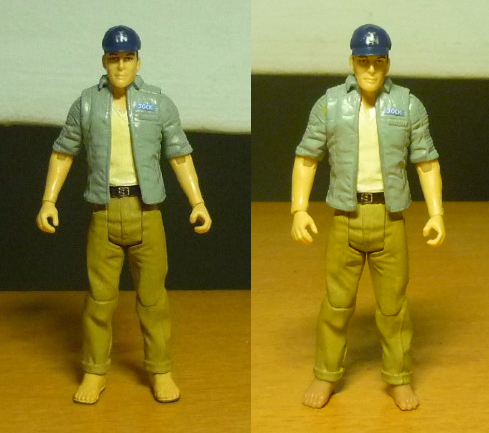 I’ve also restored the original Last Crusade Indy’s legs so that Brody now has more leg articulation. Yeah! 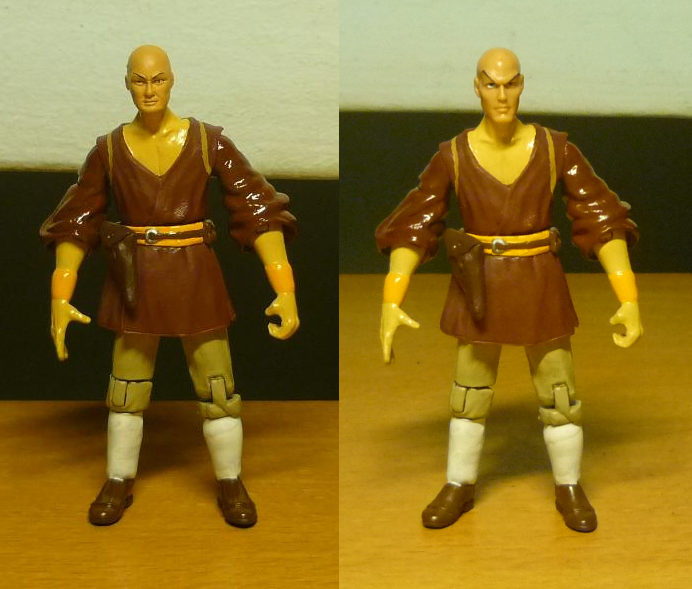 A minor change for Jock, I have replaced the original feet (which originally came from Monkey Man with the sandal straps dremeled off), with the actual bare feet of an Ugha Warrior which I happened to have available as leftover custom fodder. I had mentioned about the changes made to Satipo before and I’ll do it again here. I had acquired a plastic cast head of the Satipo prototype figure, to replace the original head (which belonged to a Star Wars Clone trooper). Additional lapels, shoulder straps, and pockets were sculpted onto the jacket, and the jacket had been repainted from yellow-green to buff. And yes, I was using a crappy camera back then.